Starting infinite analysis can be as simple as hitting the space bar, but to get the most out of it you should familiarize yourself with all the available options. The two buttons that are highlighted in the image, Analyze and Start Custom, are different ways of configuring and starting infinite analysis. Starting and configuring infinite analysis. If you click the Analyze button directly it is equal to hitting the space bar and starts infinite analysis. But there are many options you can set for the analysis which you can access by clicking the small, black downward-pointing triangle at the bottom of the Analyze button. Many users are probably familiar with this type of button which is called a split button. Clicking the triangle will open a menu where you can select “Options” to display the “Infinite analysis options.” We’ll have a look at those options later, but first let’s see what simple infinite analysis with a single analysis pane and one engine looks like in Aquarium. Through the years this has probably been the most common way of using infinite analysis so it’s a good place to start and get acquainted with the basics. If you are about to start infinite analysis in Aquarium and are looking for the analysis pane, stop looking. It isn’t there. Of course there is no need to have an empty pane hanging around taking up valuable screen space so Aquarium only displays the analysis pane when you are actually analyzing. Then it appears automatically. When you are not analyzing other panes are resized to take advantage of the additional space. When you start the analysis (either by clicking the Analyze button or by pressing the space bar) Aquarium creates the analysis pane which is shown in the next screenshot. At the top of this window we see a panel displaying various information regarding the current status of the analysis. We call this the information and control panel for the infinite analysis. The list of variations displayed below that is familiar to most users. Note that the most recent (deepest) variation is conveniently displayed at the top of the list, next to the information and control panel. One very convenient feature is that you can click on any of the variations in the analysis pane and replay them on the board. Here is one example. I’m analyzing the normal starting position, but the board shows the position after White’s third move (3.Bf4) in the second variation from the top in the analysis pane. Any of the analyzed variations can be inserted into the notation by right-clicking on it. This screenshot shows the right-click menu for the analyzed variations. Right-clicking on any of them displays this menu allowing you to copy it (Ctrl+Ins), e.g. for pasting into a forum post, or insert it into the game notation (Ins). Additionally you can copy all the analysis as text (Ctrl+Alt+Ins). Insert or copy any of the analyzed variations. Many chess players trust the first move, but less so the following moves, in the variations produced by infinite analysis. Others don’t like to add the full variations for other reasons. Aquarium allows you to add just the first move of the current variation to the notation by pressing Enter as shown in the next image. 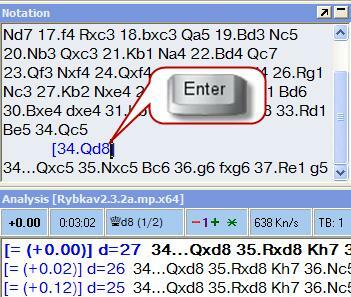 In this example I first placed the cursor after White’s 34 th move (34.Qc5) and pressed Enter. As you can see the move 34.Qd8 was picked up from the analysis pane and added to the notation as a variation. The cursor moved automatically to the position after 34.Qd8 and now that position is being analyzed by the engine. At depth 27 it sees 34…Qxd8 as the best move. If I press Enter again 34…Qb8 would also be added to the notation. If you want to examine or comment the game without affecting the infinite analysis you can lock the analysis to a specific position. Insert the best move into the notation. 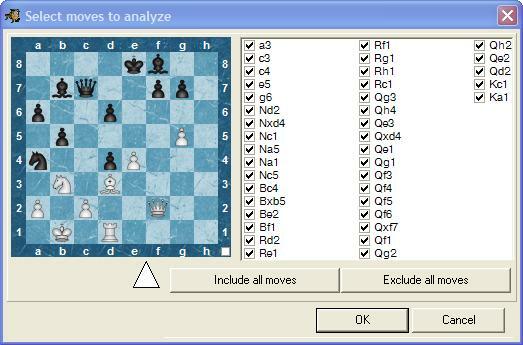 One of the shortcomings of infinite analysis is that it only gives you what the chess engine considers the best move. You don’t get any information about the second best move, the third best etc. unless you switch to multi-variation mode. Aquarium has a nice little feature that allows you to see the 10 best moves – even in single variation mode. To view the list of moves just place the mouse pointer over the current move display in the information and control panel and a tooltip will popup with a list of the best moves. The top ten moves – even in single variation mode. Now that we have seen the simplest type of Aquarium’s infinite analysis in action, let’s have a closer look at the information and control panel at the top of the analysis pane. 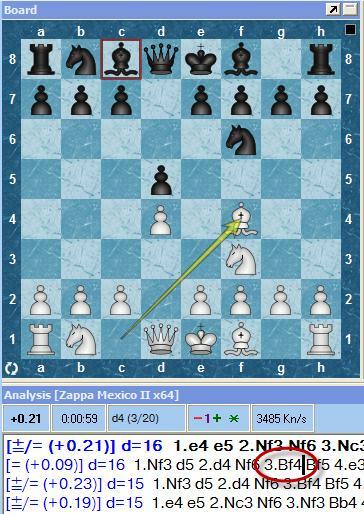 The title bar shows that this is an analysis window and the name of the chess engine (Rybka v2.2n2.w32) is also displayed there. The information and control panel. The current engine evaluation, where -0.17 means that Black has an advantage of 17 centipawns. The total analysis time, which in this case is 3 minutes and 34 seconds. The engine is currently evaluating the move Rf1 and this is the first of 39 legal moves in the position. Allows you to set various options for the analysis as described below. The number of positions the chess engine is evaluating per second. Here we see the number “101 Kn/s” which means 101,000 positions per second. A drop-down list with all available engines. It shows that we are currently using Rybka, but you can switch to a different engine at any time by selecting it from the drop-down list. Clicking this button displays the “Engine options” dialog box for the currently selected engine. This feature is described below. Items 4. and 7. require further explanation. Item 4. holds an interesting feature of infinite analysis in Aquarium. We are currently analyzing in single variation mode as shown by the number “1” between the minus and the plus sign. Clicking on the green plus will switch to multivariation mode and each additional click increases the number of variations. Likewise, clicking the red minus sign decreases the number of variations. Clicking the green asterisk allows you to choose which moves to analyze. There are several options here as shown in the next screenshot. Analyze all moves is the default. All legal moves are considered in the analysis. 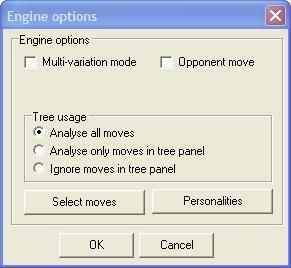 Analyze only moves in tree. This option and the next one is of interest to opening book authors and players developing their opening repertoire. In both cases they would store their analysis in an Aquarium tree (position database) and this option allows them to analyze only the moves that they have included in their repertoire/opening book. It is actually more accurate to talk about all moves displayed in the tree window rather than simply the moves in the tree. The reason is that moves that occur in the notation are displayed in the tree window and are treated as part of the tree when this option is selected. Analyze the moves you are interested in. Discard all tree moves. Let’s say that you have been developing your opening repertoire or an engine opening book. You think it’s pretty solid, but you want to check if some of the moves you have not considered so far in a certain position might bust your opening line. All you need to do is start infinite analysis, select this option and Aquarium takes care of the rest. The evaluations will tell you if you possibly missed a critical move. Again, remember that all moves in the notation are displayed and treated as part of the tree. Select individual moves to analyze. Here you can decide precisely which moves are analyzed and which ones are excluded from the analysis as shown in the “Select moves to analyze” dialog box in the image. You can mark/unmark each move individually. They are all marked by default. If you only want to analyze a few moves it’s fastest to click the “Exclude all moves” button below the move list and then mark those moves you are interested in. You can also exclude moves without opening this dialog box. While the analysis is running simply hold down the Ctrl key and then use the mouse to make the moves which you want to exclude. Exclude moves by holding down the Ctrl key. Ok, item 4. took it’s time to explain and now we move on to the final item on the information and control panel, item 7. The button to the right of the engine drop-down list displays the “Engine options” dialog box for the currently selected engine. The “Tree usage” options are already familiar. They are equivalent to the options when you click the asterisk in the information and control panel as discussed above. The same goes for the “Select moves” button which allows you to exclude moves from the analysis. If you select “Opponent move” the engine will analyze the threats of the side that just moved. “Multi-variation mode” has a nice twist. If you select this mode the following options are displayed. Here you can select the number of variations that should be analyzed, but the second field “Delta” defines a maximum deviation from the evaluation of the best variation. Here it is set to 100 centipawns (1 pawn). Aquarium uses this parameter to decrease the number of variations if their evaluation falls below this limit. The “Personalities” button allows you to change the engine parameters for the currently selected engine. One of the unique features of Aquarium is that it stores the results of all infinite analysis that is sufficiently deep. In the past you either had to save the results of infinite analysis in the notation or it was lost forever. If you spent a lot of time analyzing a specific position you might or might not remember that analysis if you ran into the same position in a different game. No chess analysis software reminded you of your previous analysis. This is all changed with Aquarium. If you run into a position that you have analyzed previously, Aquarium will let you know. It makes no difference if the position was reached through a different move order or even if it’s in a game in a different database. The screenshot shows a part of the Aquarium status bar when the position you are viewing has been analyzed before. The best move that was found is displayed along with its evaluation. If you place the mouse pointer over the status bar the full variation is displayed just like it was displayed in the analysis pane when you ran infinite analysis. Right-clicking on the status bar displays a menu allowing you to insert your old analysis into the current game. If you like you can also display the infinite analysis evaluations in the tree window. Right-click to insert stored analysis. Another important feature of infinite analysis in Aquarium is that Interactive Deep Analysis (IDeA) can take advantage of the stored results to build its analysis tree. This means that if you have spent some time analyzing a position with infinite analysis, you can start IDeA and it will reuse and expand on the analysis that you have done. Additionally IDeA stores it’s analysis in the infinite analysis history, so the status bar will also show moves that were analyzed with IDeA. So these two analysis methods work very well together. Aquarium allows you to store infinite analysis configurations. This is especially helpful for those running multiprocessor or multicore computers. If you are running a dual-core computer, you can for instance create a configuration where you automatically run two different engines, one on each core. You can run them both in the same analysis pane or each engine in its own pane. On a quad-core one engine can be given 3 processors and then you could use the fourth core for a tactical engine, like Rybka WinFinder. Infinite analysis and Interactive Deep Analysis (IDeA) are just two of the many tools offered by Aquarium. They show that the developers have done an excellent job in improving on a well known analysis method, as well as creating a new and powerful one, which I believe is a must for every serious chess player. Next month we’ll continue our discussion of Aquarium and Rybka 3.